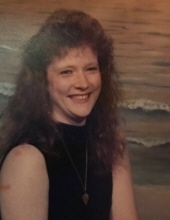 Vera Elizabeth Jackson "Liz" McKinney 47 passed away Saturday, October 13,2018. Liz was born in Harnett county, she was the daughter of late James " Buddy" and Clara Ann Jackson. In addition to her parents Liz was preceded in death by her grandparents James & Mary Jackson, George Dennis and Vera Ryals, and granddaughters, Taylor West and Hailey Farmer. She is survived by her husband Thomas McKinney of Linden; daughters, Jessica McKinney of Dunn, Jennifer Jackson Townsend and Michelle Melvin of Erwin; a brother, James Jackson and wife Patricia of Dunn and a sister Diana Jackson & husband Ray of Midway; eight grandchildren and several nieces and nephews. There will be a memorial service on Wednesday October 24, 2018 at 11:00 a.m. at Colliers Chapel Church in Linden with Rev. John Haney officiating. To send flowers or a remembrance gift to the family of Vera Elizabeth Jackson "Liz" McKinney, please visit our Tribute Store. "Email Address" would like to share the life celebration of Vera Elizabeth Jackson "Liz" McKinney. Click on the "link" to go to share a favorite memory or leave a condolence message for the family.